IT BEGAN CLOSE TO HOME. When a close family member was diagnosed with age-related macular degeneration (AMD), Karen and Herbert Lotman began asking questions. What they found was little was known about the causes and effects of a devastating disease that leaves millions of people around the world with little sight and little hope of ever restoring it. So they set out to change that, founding the Macula Vision Research Foundation (MVRF) in 1997. BREAKING NEW GROUND MEANS OLD RULES. A more aggressive approach to curing macular degeneration was needed and that would demand a more progressive and innovative business model. They determined that 100% of MVRF administrative costs would be funded directly by their private foundation, ensuring that every dollar donated would go directly to meaningful research. 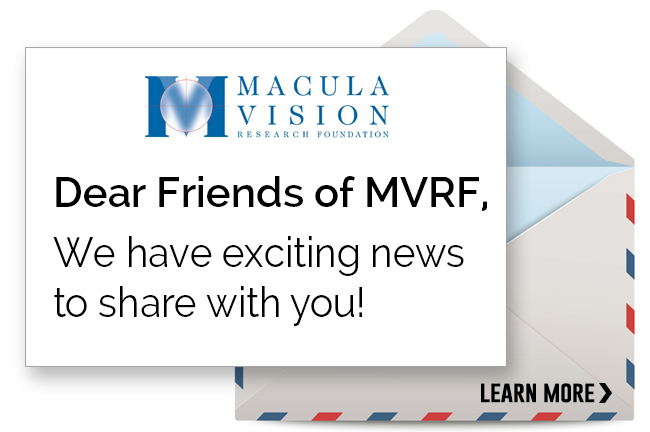 MVRF is an independent nonprofit 501(c)(3) public charity, relying entirely on donations to fund the research. They are our grandparents, our mothers and fathers, our husbands and wives. They are people we know, love and depend on. AMD impacts people and families all over the world. Book lovers who can no longer read. Lifelong travelers who can no longer drive. And parents living in fear they will pass down the gene to the next generation. With the loss of their central vision, people with AMD are no longer able to live the lives they once enjoyed. Yet they adapt and persevere, they pray and remain hopeful. In the research we have helped to fund so far, and in the even more important work to come, our goal is to reward that hope with a cure. It may come in the discovery of a new drug, a surgical procedure or some combination thereof. But with your support and our direction, it will come. IT TAKES INTENSIVE RESEARCH TO FIND EXCEPTIONAL RESEARCHERS. MVRF is guided by an International Scientific Advisory Board comprised of leading retina researchers from around the world. We award funding only to the best of the best. And with no ties to any one institution, our research dollars are directed to the most promising ideas.